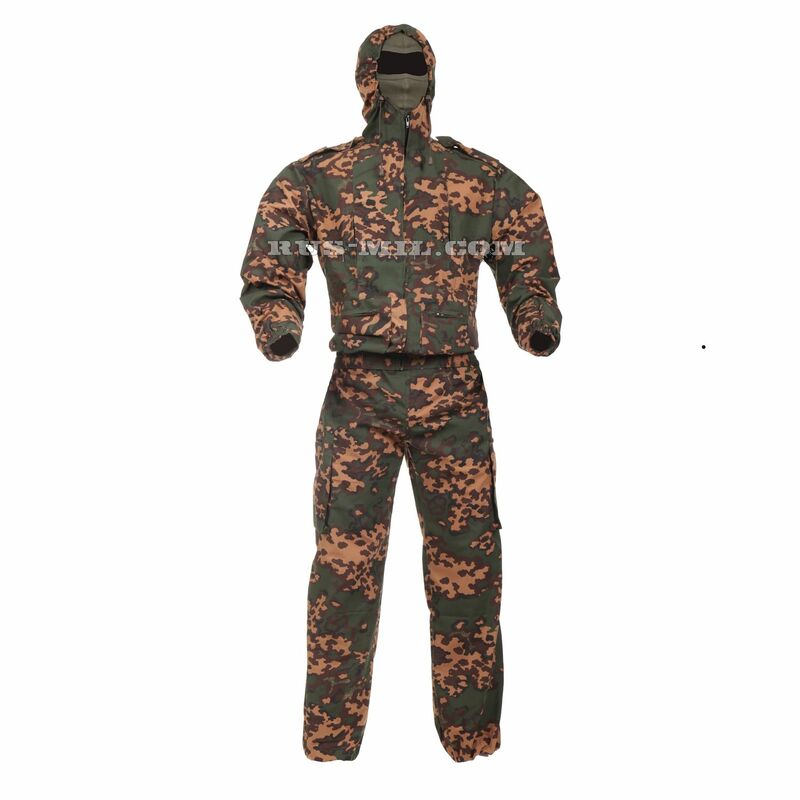 We bring to your attention a complete set of camouflage clothing "Taktika-1" Partisan Pattern. This is a summer light and very comfortable suit that will show itself well both in the cool environment of the early morning and in the daytime heat. This variant of vestment is ideal for daily wear, and for one-time tasks like going to the forest for mushroom-berries or to ponds – for fishing. Costume "Taktika-1" Partisan Pattern is also in great demand among fans of military games, like airsoft and paintball. It is made of light, but dense short-sleeved fabric with a masking pattern "Number". The material of which the suit is made has excellent strength characteristics, it does not rustle during movement, does not crumple, does not fade and does not burn out in the sun. The fabric is 35% cotton and 65% synthetic fiber – polyester, which explains its practicality and functionality. The suit "Taktika-1" Partisan Pattern is pleasant to wear: the fabric is light and breathable. It can safely endure the heat, engage in active activities – work, run, jump, hide. The fabric of the suit absorbs moisture well and very quickly evaporates it. The costume can be worn directly on the body, which makes it an excellent uniform for the hot season. The set "Taktika-1" Partisan Pattern consists of two items – jackets and trousers. The jacket of the suit has a free cut: it absolutely does not hamper the movement, so it is convenient to engage in sports, and to overcome obstacles, and to walk by hand. She has excellent masking properties, because she has a comfortable hood, which, in addition, is equipped with a mosquito net. The grid is functional: it is removed inside the hood as a useless thing, and the second plus is that it tightly covers the face without any fasteners. The hood can be adjusted on the face oval and adjusted so that neither sand nor garbage is poured under it. The jacket has a central zipper closure. At the bottom of the jacket provides an elastic band that provides a tight fit in the belt: it gives a reliable protection against insects, sand and other debris. Tightening bands are also found in the cuffs of the sleeves. The jacket is very well seated on people of different builds. She has four pockets: two side pockets – overhead and two breast pods. Lower pockets offer vertical access from top to bottom, and they are closed by valves on the textile contact tape. The upper chest pockets have vertical slots, fastened with zippers. Access to them is carried out by an opposing hand – cross crosswise. On the shoulders are made epaulettes, one edge of each is sewn, and the second is fastened to the button. Trousers set "Taktika-1" Partisan Pattern, thanks to elastic bands, fit tightly in the belt, which makes them a very practical solution for walking in the woods, for extreme hikes and military sports games. The bottom of each leg is also pulled by elastic bands. Pants are designed for carrying with a belt. In this case they have 5 wide loops. Pockets on the pants are four. Two scoring units are located on the hips, the inner part is sewn from the main fabric. And two pockets are located on each side, just above the knees. These pockets are overhead, capacious, they zip up. The suit "Taktika-1" Sfera Pattern is unpretentious in the care. It is recommended to wash it with powder without bleach, it is desirable to use a special tool for colored things. The water temperature is not more than 40 degrees Celsius.